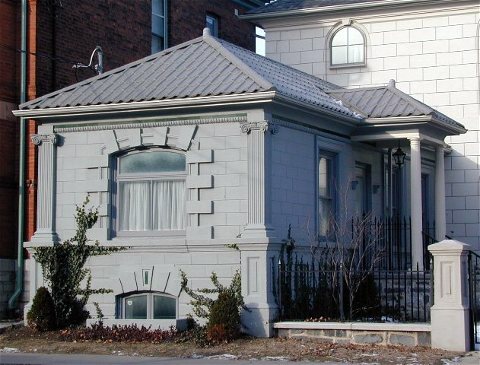 ARCHITECTURAL STYLES can be a handy tool to understand heritage buildings, but it is only one of many. It is also important to look at such determining factors as technological innovations, building materials, demands of the site, interior plans and functions, the purpose of the building, the historical context, the characteristics of an individual architect and/or designer, and the social aspirations of and restraints on the owners. We are seduced by the thought that, the further back in time we can place our building, the more interest it has. This undermines the value of the building, as it relates to whatever time period saw its conception. It’s all interesting! 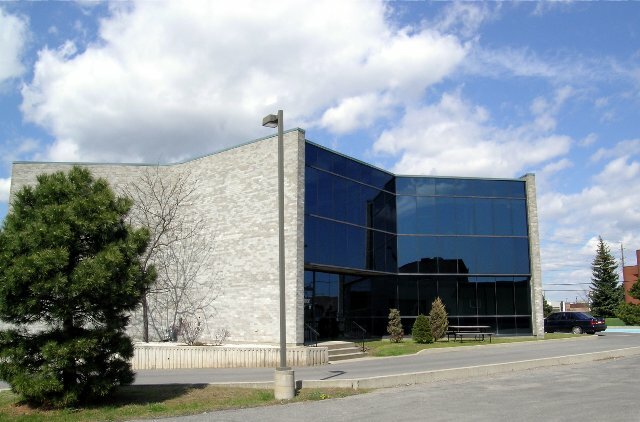 Late 19th century and 20th century structures are only now being appreciated in the Kingston area (see Jennifer McKendry, Modern Architecture in Kingston). Compare the contents of volume one of Buildings of Architectural and Historic Significance, written in 1971 and containing only buildings that predate 1865, with volume six, written in 1985 and containing many later buildings running into the 1920s. Or Margaret Angus’s The Old Stones of Kingston of 1966 describing buildings before 1867 with Jennifer McKendry’s With Our Past before Us: Nineteenth-Century Architecture in the Kingston Area of 1995 describing buildings to 1900. 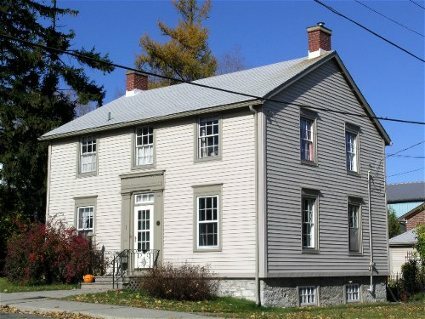 To own a house built in the 1880s is to visualize a context of the country struggling with unity issues, the completion of the railway across Canada, the North-West Rebellion, the establishment of a national art gallery, the excitement of the French avant-garde art movements such as neo-Impressionism, the growth of skyscrapers in the United States, and the spreading influence of the Beaux-Arts movement in Canadian architecture. The 19th century was basically split between classicism and medieval revivals. Classicism, derived from the Greek and especially the Roman periods, was reworked in the Renaissance and Baroque, and manipulated by the Neoclassicists in the late 18th century. 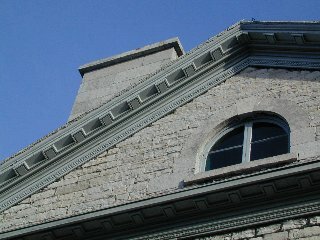 A new enthusiasm in Britain and the United States was developed for Greek art and architecture in the 1830s but had limited appeal in the Kingston region. During the 1870s, Empire style, which derived many of its forms from the French Renaissance, gained ground locally. 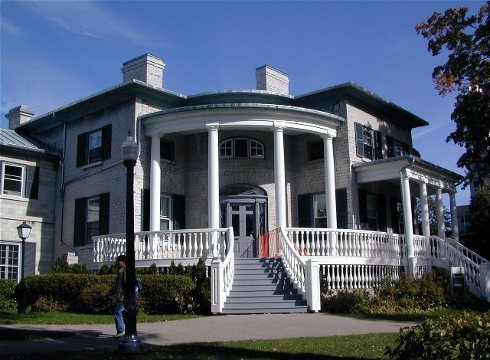 Towards the end of the 19th century and well into the 20th, a love for classicism was rekindled with the studies of Canadian architects at the Ecole des Beaux-Arts in Paris, as well as the growing influence of American architects interested in that style. 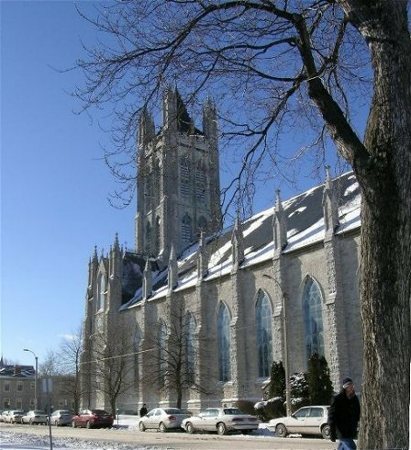 By the mid 19th century an alternative style, Gothic Revival, competed with classicism (which continued to flourish). Gothic looked back to the medieval British, French and Italian eras. 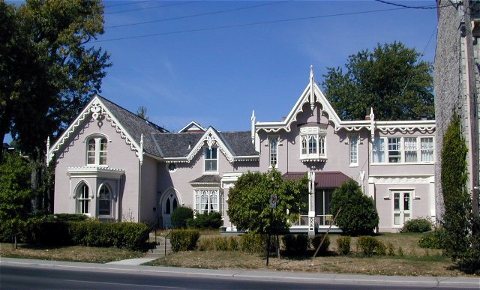 By the 1880s, Romanesque Revival was gaining favour, at the same time as a number of these styles converged into an eclectic style, sometimes labelled “late Victorian.” It is thus apparent that the difficulty with “Styles” is that there is much merging of characteristics and overlapping in time. The use of the names of British royalty to signify stylistic periods such as “late Georgian” deepens the confusion. Architects had to be well versed in all these styles and be prepared to turn out classical designs as readily as medieval ones. As the 19th century gave way to the 20th century, there was a vast repertoire of styles available. 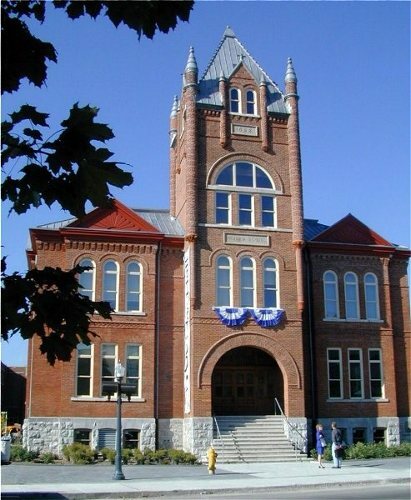 Gothic Revival continued, particularly for religious buildings and educational institutions. 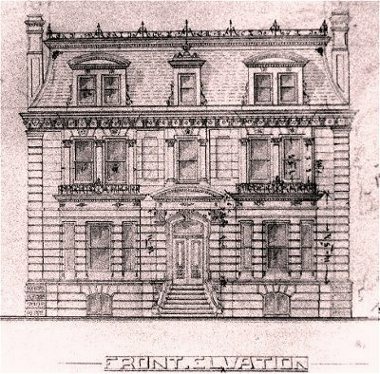 Its old rival, classicism, gained new strength as “Beaux-Arts.” There were also Arts & Crafts, the Chateau Style and Queen Anne. It’s not surprising that modern architects reacted by rejecting ornament and historicism (which often hid or obscured structural materials) in favour of honesty in materials and forms. The strength of steel permitted wide expanses of “weak” areas that could be filled with sheets of glass. Solid walls began to shrink and buildings shimmered with transparency. 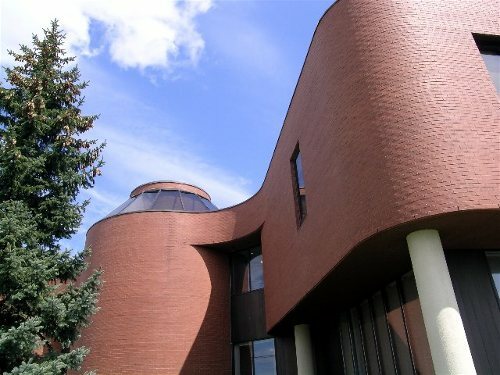 Reinforced concrete allowed walls surface to swell and recede, sometimes making a building more like a rounded sculpture than a box. Boxes, on the other hand, were created with flat roofs and machine-like qualities. Pre-fabrication threatened the individuality manifested in earlier buildings, which had received so much hand-crafted treatment. 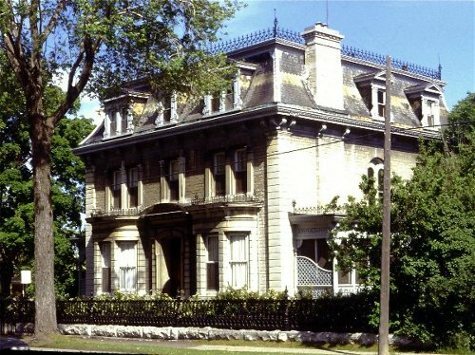 The Empire style relates to classicism, as seen in the symmetry, central focus and detailing of Kent House, 85 King St East, built c1877 for Rybert Kent by architect John Power. Classicism is applied with a heavy hand. An Empire roof is typically mansard - a roof with a double slope. The lower slope is tall and steep-pitched. The skyline is often accented by an iron fringe. There are usually dormers to light the attic – now good habitable space because of the gain in head-room due to the steep pitch of the roof. Gothic Revival is the style of choice for many churches after about 1840, for example, St Mark’s in Barriefield (1843, Alfred Brunel), St Mary’s Cathedral (1843 and enlarged 1889 by Joseph Connolly), Sydenham Street United (Methodist, 1851 by William Coverdale), the Congregational Church (Masonic Hall) on Wellington St at Johnson (1864 by John Power), a nd Christ Church in Cataraqui (1870 and 1877 by the Power & Son firm). Central towers dominated many of the buildings until the second half of the 19th century, when asymmetry became acceptable. Romanesque Revival provided an alternative style for churches as the 19th century drew to a close. 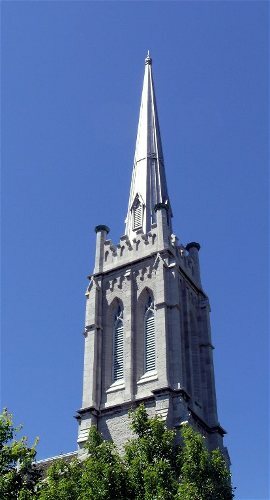 Joseph Power designed a striking composition for St Andrew’s Presbyterian Church in 1888 on a corner lot at Princess and Clergy Streets. Heavily textured stone and massive round arches create a sense of power. 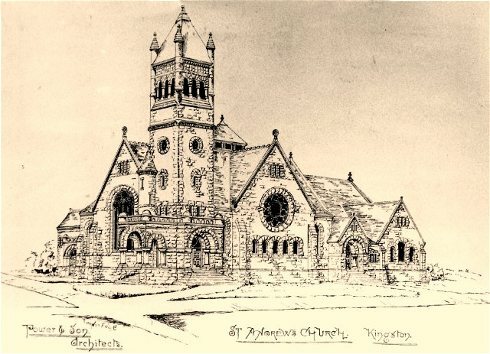 William Newlands choose this style in 1892 for Victoria School on Union Street. Certain examples of modern architecture have forms that seem more liberated because of the strength and flexibility of materials, for example, architect E.A. 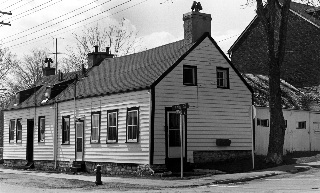 Cromarty's buildings on Taylor-Kidd Boulevard of 1986.